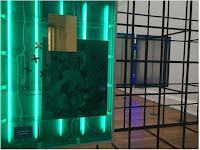 Let me draw your attention to Tate Britain, the building and its galleries, anew. 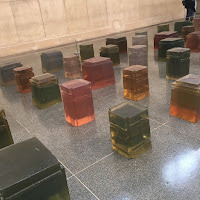 If you already know it please bear with me while I sketch its wonders for newcomers, or those who haven't visited for a while, mention the free 'Art Now', and introduce the (ticketed) special exhibition celebrating 30 years of the work of Rachel Whiteread. The building itself, still fresh from its renovation, shines from top to bottom. A new black and white stone staircase (see detail) opens up the entrance hall. 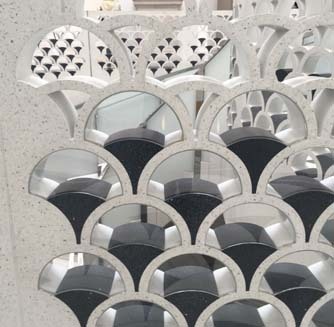 In this reviewer's opinion, the architects, Caruso St John, have here created a work of art in itself. For more details of the artists the architects brought in to work on the entrance as a whole, see the online arts magazine Dezeen. Tate Britain allows you to view the whole of its permanent collection - British Art from 1500 to the present - free of charge. Art Now is also free, in this case a show of work by Simeon Barclay, The Hero Wears Clay Shoes. A picture of one of the artist's light works is shown here. 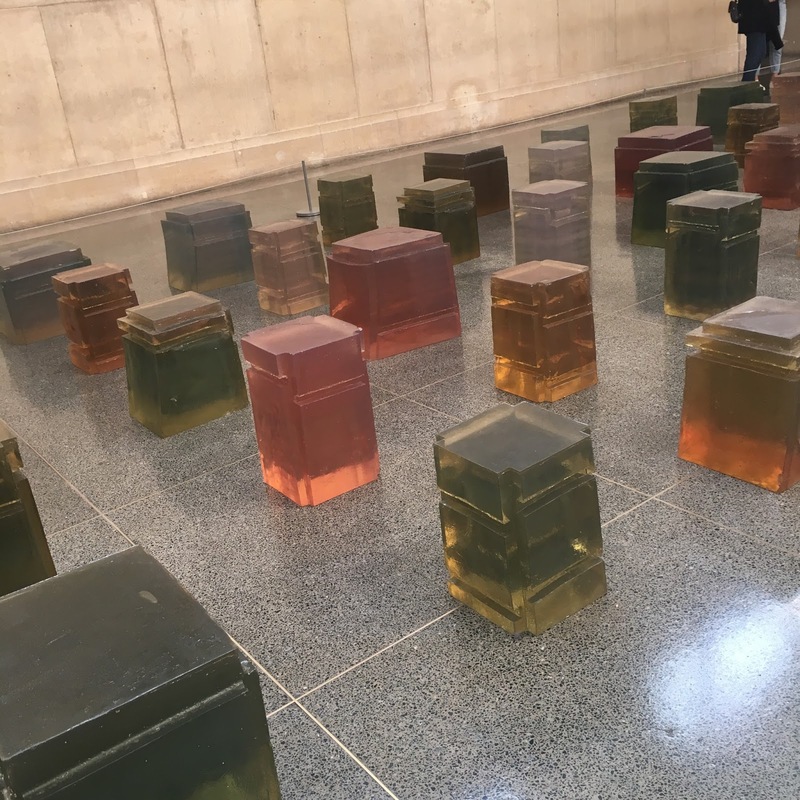 The otherwise ticketed artist, Rachel Whiteread, is showing free the beautiful Untitled (One Hundred Spaces). 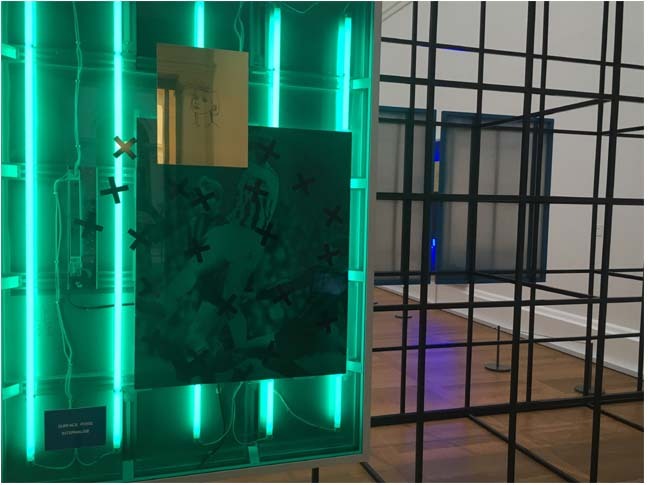 Made from light-reflecting coloured resin, the work fills the Duveen Gallery, each piece responding to the light above it. In the corridor by the entrance to Whiteread's exhibition there is a selection of articles from her studio, including her working notebooks (see detail), which is the final freebie. Join as a member of Tate and all exhibitions are free for you to visit as many times as you wish. You might also like to try the newly renovated Djanogly café downstairs: the cakes are little masterpieces - and oh so edible. 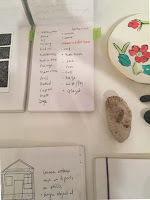 I will cover the main Whiteread exhibition in a later review.